Santander has revealed details of its 2010 convention that attracted 2,500 senior managers across the bank. The Santander Convention was held at London Olympia and managed by agency Fresh Group in February. Santander communications director Matthew Young said the aim of the 2010 convention was to deliver a "fully immersed Santander brand experience, together with an inspiring and informative networking space for delegates to converge during coffee and lunch breaks". Fresh Group has managed seven events for Santander since 2008, and 2010 was the third consecutive year the bank had appointed the agency to run its convention. "Fresh applied its unique blend of professionalism, creativity and enthusiasm to produce another fantastic Santander Convention," said Young. "The agency's expertise meant the difference between delivering a great event and an unforgettable one." Fresh Group co-founding director Julie Besbrode said: "This year's brief enabled us to push the boundaries, creating a memorable event that captured the essence of the world's third-largest bank." Santander also appointed the agency to its UK corporate banking conference in January following a competitive pitch and an e-bid. 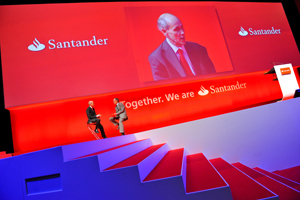 The event comprised a conference and gala dinner for 250 Santander staff.